Discover the power, speed and versatility of the Dornier Medilas® H 140. Dornier Gemini is a premier, full-functional urological platform that provides an unparalleled solution for both lithotripsy and endourology procedures. Equipped with the latest imaging technology, superior open access design, and flexible patient positioning, Gemini is the optimal solution for both urologists and patients. Accessibility: Open access design enables patient and urologists comfort while localizing kidney stones and other urological issues. Proven Technology: Integrated with Dornier’s proven shock-wave technology, deliver consistent shock wave output to boost success of non-invasive kidney stone treatments with proper patient positioning. 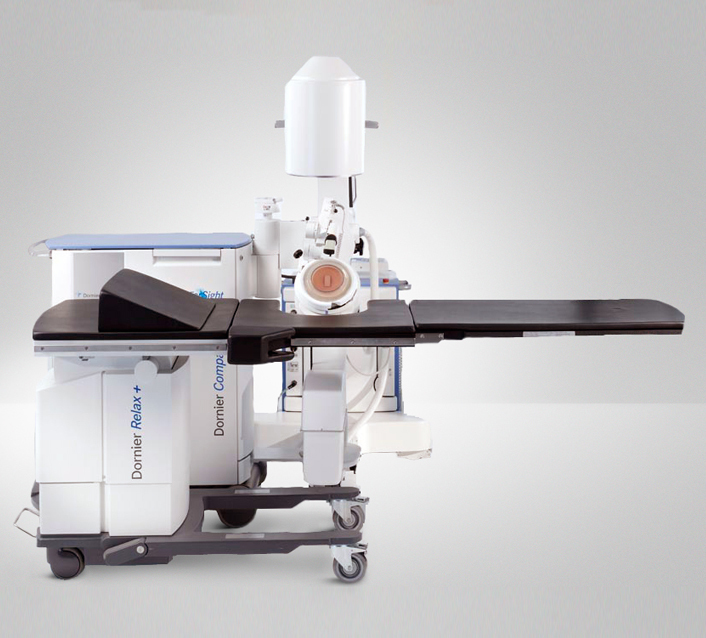 Addressing a broad range of applications, Dornier Genesis is an advanced urology imaging system designed with the physician’s office or hospital’s workflow in mind. Full cystoscopy capabilities combined with a 340 kg (750 lb.) patient weight limit and the latest flat panel imaging technology on the market today, makes this an efficient and must have system for a variety of urological exams and procedures. Adaptability: Ideal for both hospitals and large medical centers. Patient Centered: Imaging is easily viewed from a wide variety of angles without having to move the patient. Flexible: Accommodates patients of various age groups, weight range, and handicaps. The Dornier Compact Delta II is the world’s best selling lithotripter. Highly effective, this versatile system provides the flexibility necessary for easy positioning and accurate stone targeting. When combined with the Relax+ patient table, this unique system, equipped with an integrated C-arm, is not only used for ESWL, but a wide range of cystoscopy procedures. Adaptable: Integrated with a versatile patient table and flexible therapy head for accurate stone targeting. Clear Imaging: Rich, vibrant views are facilitated with X-Ray or ultrasound imaging technology. Proven: Dornier’s tried and true EMSE technology is the gold standard in shock wave excellence. Dornier Relax+ is the optimal patient table that gives you the flexibility you need to get the job done. Easily switch between treatment modalities such as endourology and lithotripsy without having to change patient positioning. Lightweight: Carbon fiber tabletop design provides all of the quality and strength you need without adding extra weight to the device when transporting. Versatile: Full range of movements including Trendelenburg and isocentric tilting eliminates the need for constant patient or physician repositioning. The Aries® 2 combines award-winning design together with proven EMSE electromagnetic shockwave technology that offers treatment options for a range of Urological and Orthopaedic indications. The Aries® 2 applicator features SmartFocusTM technology in both Standard and I-Shaped applicators – providing the ability to easily adjust shockwave output at the touch of a button, without any additional add-ons. 0-100 Real Quick: The Aries® 2 applicator features a fully closed system complete with an automatic, rapid air-pocket removal system. This means an easy start-up and operation for users, with close to no waiting time beforehand. Modular Concept: Thanks to its modular concept you can adapt the Aries®2 according to your needs. The Aries®2 comes with either a tabletop setup or together with a cart, allowing for easy movement of the device from one room to another and storage of daily needed equipment. *The Aries 2 is for distribution and use in specific countries only. Please contact our sales representatives in respective regions for availability. Dornier Medilas H Solvo easily integrates into any OR workflow for the destruction of stones as well as soft tissue interventions in endourology. This 30 W holmium laser provides the power necessary to get the job done all within a compact and transportable system. Equipped with special advanced modes, usability and increased efficiency is optimized. No other device available on the market provides this level of flexibility and versatility! Easy: Programmable settings allow you to quickly choose the treatment mode best suited for the clinical situation. Fast: Simply transported and requiring no warm up time, set-up is quick and efficient. Efficient: Wide range of energy and frequency settings that ensure quick and precise breakdown of any stone. Click here to watch this video of a ureteroscopy and laser lithotripsy procedure using the Dornier Medilas H Solvo. Among the smallest in its class, the Medilas H UroPulse is a compact holmium laser that is readily integrated into trolleys, racks, or ceiling pendants. This 20 W system is optimally designed for effective stone management and soft tissue applications. The color graphical interface allows the physician to promptly modify the wide range of energy and frequency settings to ensure a quick and precise set-up throughout a variety of surgical settings. Effective: Wide range of energy and frequency settings to ensure quick and precise breakdown of any stone. Ergonomic: Easy to read graphical interface and wireless programmable footswitch provides ergonomic workflow. Convenient: Small and compact desktop design integrates seamlessly to optimize space. Dornier offers a broad fiber portfolio with a wide range of sizes and various designs to meet our customer’s needs and preferences. Our fibers are built for precision! Performance Innovation: Intelligent fiber recognition system that optimizes holmium laser performance and overall patient results. Enhanced Focus: Superior technology that efficiently transfers the laser beam within the fiber core to achieve maximum power transmissions. Reliable Durability: Exceptional quartz ferrule design that boosts and extends the effectiveness of your fibers. Tested and Adaptable: 100% of our fibers are quality and performance tested prior to shipment and are available in multiple sizes to fit any scope preference. Over the years, Dornier MedTech has provided a variety of products designed to serve the needs of medical centers across the world. To learn more about our full suite of products, please contact us.